Making its debut at the Shanghai Auto Show, the Lotus Evora GT4 is designed to hit the track in 2020 and be part of the new Lotus driving school in China. It’s a great blend of the British engineering we’ve known and loved with the international flair that has kept the company above water. Under the hood is a 3.5-liter V6 engine with a max speed of 170 mph and a six-speed sequential transmission. You can expect a pretty similar build in this concept as you can find in the Evora road cars—but with a far more lightweight aluminum chassis and aerodynamic tweaks to really hone in its race-readiness. Even the car’s instruments have been upgraded. Inside, you’ll be able to find a six-inch color screen dedicated to data logging and letting you know if something is going critically wrong. You can find a full list of the specs and safety improvements in Lotus’ press release—they’re pretty great. 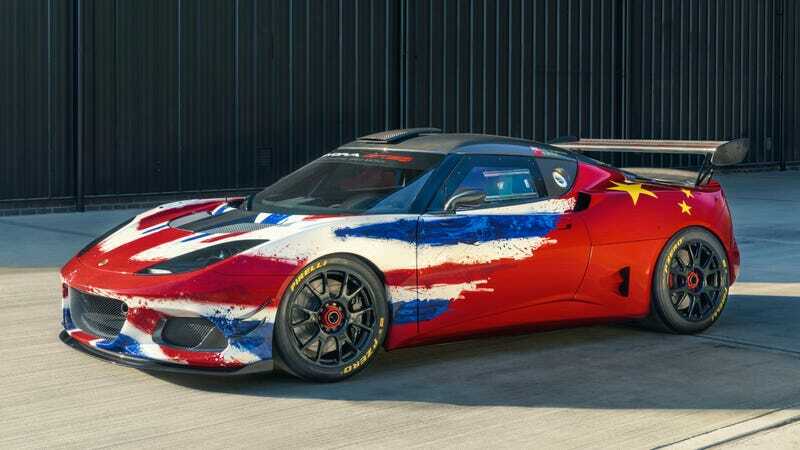 Arguably the best part of the Evora GT4, though, is the livery. A watercolor-esque Union Jack is plastered on the front, looking like the car drove through a perfect mist of the flag. That fades into the Chinese flag at the back in what is probably the classiest dual-country livery I’ve had the pleasure of seeing. I hope they retain some aspect of that design when they make the transition to the race car, even if it’s just the idea of the watercolor splash.